The Synod of Bishops on the Family is now underway at the Vatican. Pope Francis, the bishops, clergy and laypeople will meet for two weeks (Oct. 5 - Oct. 19) to discuss pastoral challenges to the family. Keep up with America's daily coverage and analysis here. The "instrumentum laboris," or working document for the coming October Synod on the Family, is a rather overwhelming wish list of pastoral outreach initiatives that the universal church hopes the local church will undertake more fully and better than before. Read more. We have an openhearted role model in Pope Francis, who embraces the world in all her tawdriness and tells her, sincerely and tenderly, that he loves her and God loves her. He reminds us that we all are capable of, and called to, great joy. 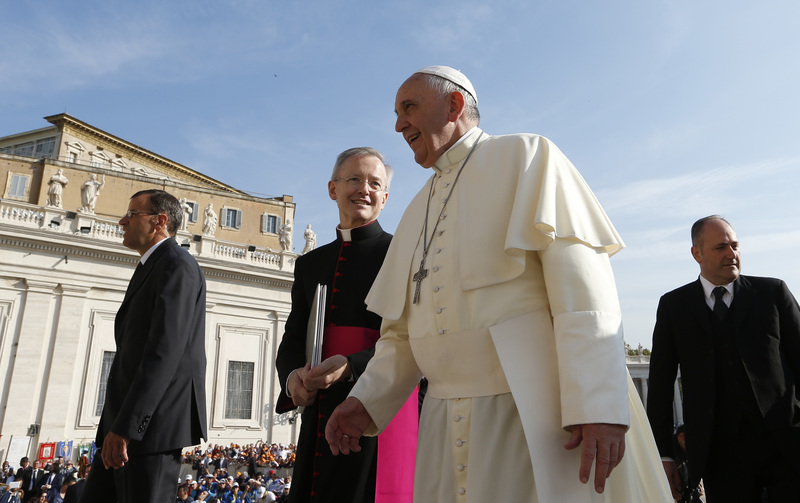 Love first; ask questions later, he seems to say, which the document calls the pope’s “pastoral creativity.” Read more. The Nuclear Option: A call to refocus on the love between a man and a woman, Cornelius F. Murphy Jr.
Revisiting Remarriage, Mary Ann Walsh, R.S.M. Cardinal: Is teaching on sexuality changing? Father Thomas Rosica of Salt & Light Television talks about the upcoming synod on the family on "America This Week" on SiriusXM.